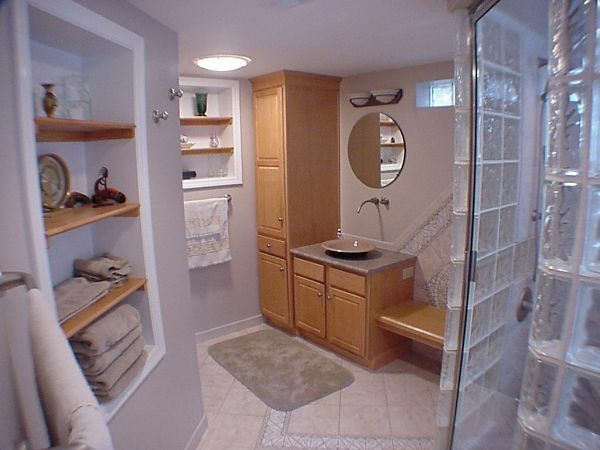 Bathrooms are often small spaces and storage is always a priority in bath design. When remodeling a bathroom, it is important to plan and to be creative with bathroom storage cabinet selections and placement. The planning process begins by making a list of all the things you want to store in your cabinets such as towels, grooming supplies and appliances, soaps, cosmetics, clothing and even cleaning supplies. Next, survey the available space. Think about the walls, areas around sinks, tubs and toilets, and even a knee wall under a window as possible places for storage. This is where the experience of a bath design professional can really be helpful. They know ways to maximize storage in the room and create an attractive environment. 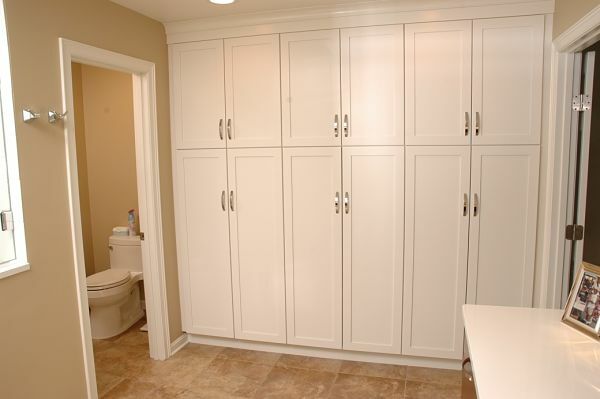 Bathroom storage cabinets were custom fitted to the space in this master bath. Drawers of varying depth were used for the space under a window and for the vanities. 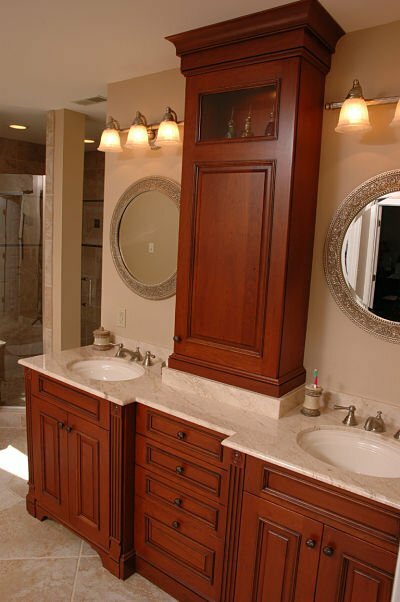 Storage cabinet towers have become one of the best ways to optimize space in a bathroom. 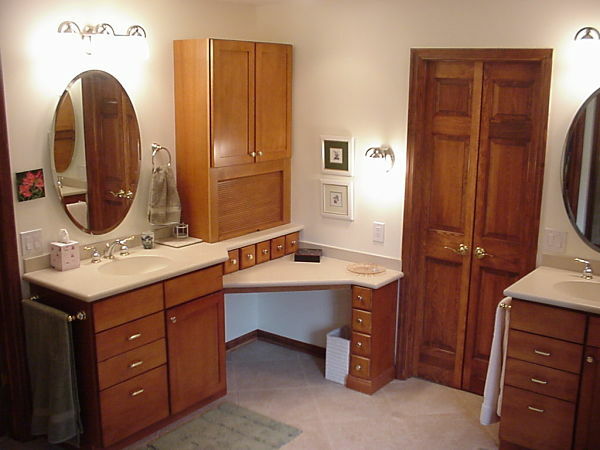 They can be added to a vanity for handy storage and to separate dual sink areas. The counter-to-ceiling interior shelves can be used for many items including towels. A drawer or an appliance garage can be added to the configuration to store small items. A storage cabinet tower includes a glass inset for display, crown molding and separates dual vanities in this his & her bathroom. 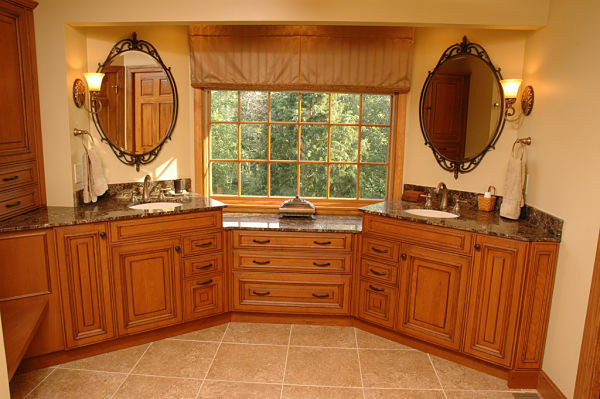 Vanity counters in many bathrooms are often cluttered with the items people use daily. Appliance garages, which are commonly used to hide and store mixers and other appliances in a kitchen, also can be used in bathrooms to contain clutter and store items such as hair dryers, grooming supplies and makeup. 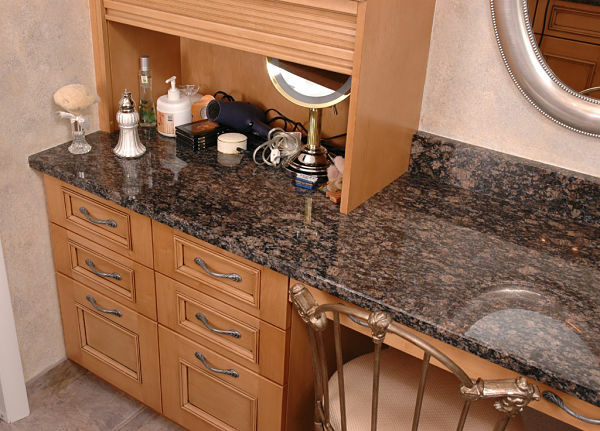 An appliance garage was used with a storage cabinet tower on a vanity to conceal small items that otherwise would occupy space on the counter. A makeup mirror, cosmetics, a hair dryer and other grooming supplies are at hand and can be hidden from sight after use to keep the space from appearing cluttered. Items are often lost, forgotten or become disorganized in cabinets. Pullout shelves solve the problem by making storage spaces more accessible. Contents can be easily viewed and stored in the proper place. Two pullout shelf inserts were added to this full height cabinet to contain and provide easy access to small items. 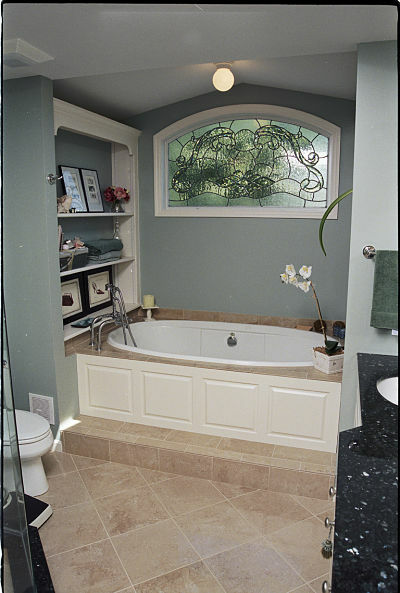 A niche can be used for both function and display in a bathroom. Since a niche is recessed into a wall it will take up less space in the room than a traditional cabinet. Open shelves can be added for handy storage. 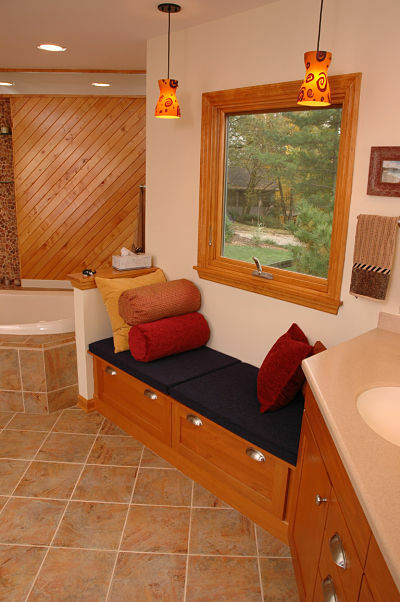 In a shower, tub or commode area a niche can be used for bath essentials. Wall niches were used to provide handy towel storage and for display. 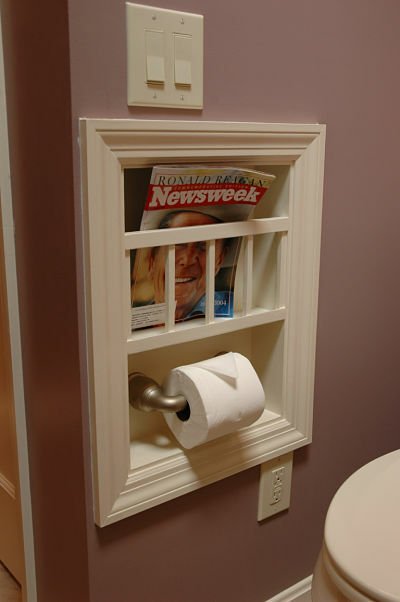 A wall niche in a commode area holds tissue and magazines. 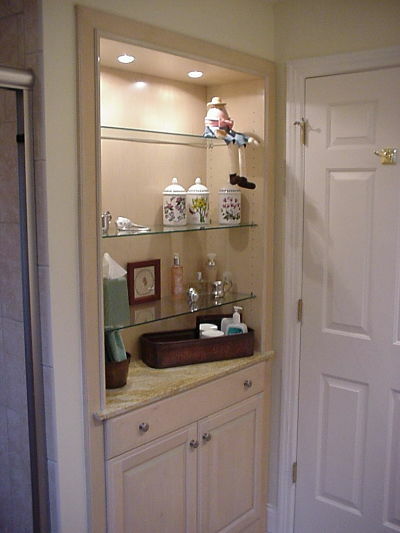 Narrow medicine cabinets can be either recessed or wall mounted. 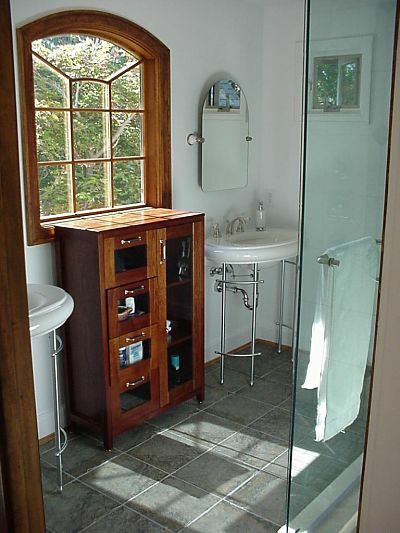 They can blend into a bathroom when hidden behind a mirror or add an architectural element to the room. 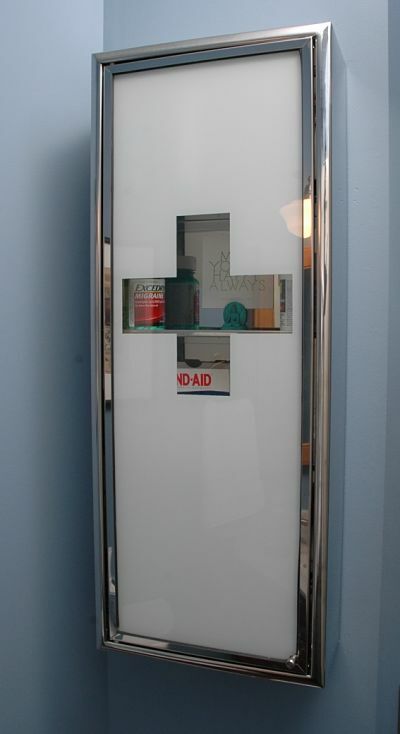 A wall-mounted medicine cabinet mimics the logo of the Red Cross and adds a whimsical decoration to this bathroom. A long, narrow recessed medicine cabinet with a dark wood finish is divided in two to provide storage and create interest in this his & her bathroom. Bathrooms may have nooks where open shelving can be used to add functional storage. Open shelves work well in tub, toilet and sink areas where cabinets would be difficult to install and handy storage is needed. Open shelves provide convenient storage for soaps and towels and a place for display in a tub area. 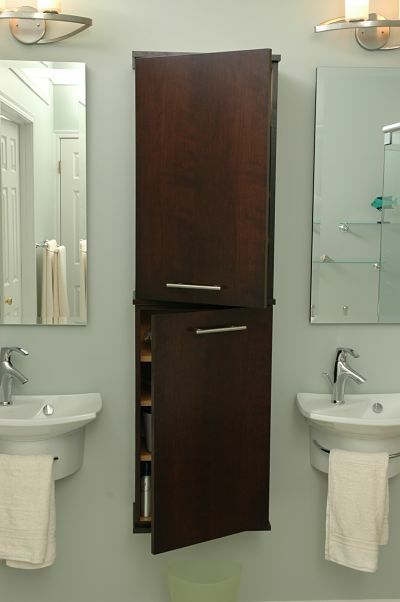 A furniture-style cabinet can be an ideal solution for storage in a small bathroom where floor space is limited. A mission-style cabinet with glass doors provides the right fit with four drawers and three shelves of storage space for this small bathroom. The legs lift the cabinet and create an illusion of space by exposing more of the floor. Base cabinets are versatile and can be used creatively to solve storage problems in small rooms. They can include shelves and/or storage drawers. Most commonly they are used in vanities but can also be used as an island, peninsula or room divider. 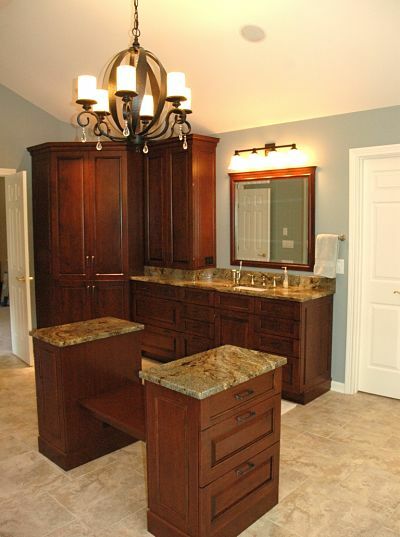 A base cabinet was used to create a commode area and provide a solution for storage in this master bath. Two base cabinets create an island in this master bathroom. Five base cabinets were used on the wall to form a linen storage tower and vanity. If wall space allows, the type of tall storage cabinets used for kitchen pantries can be used to create a linen closet in a bathroom. For optimal storage the depth should be 12 to 14 inches. A wall of streamlined tall cabinets provides storage in this bathroom. When space is tight, recessed cabinets many provide a solution, especially in a room where a door swing must be considered in configuring cabinets. 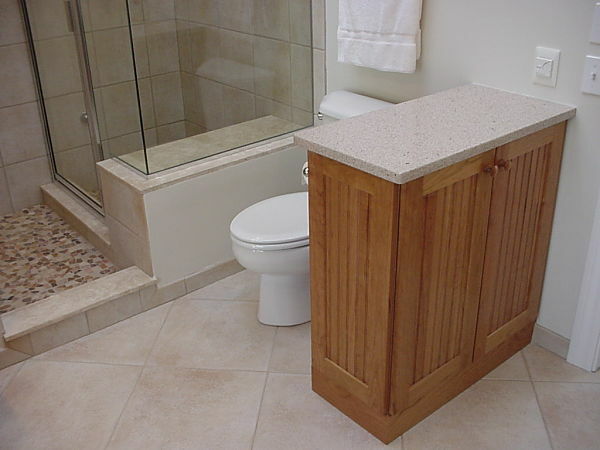 A recessed cabinet with open shelves and base storage was used in this small bathroom. The cabinet was placed in wall where a door swing was a factor. 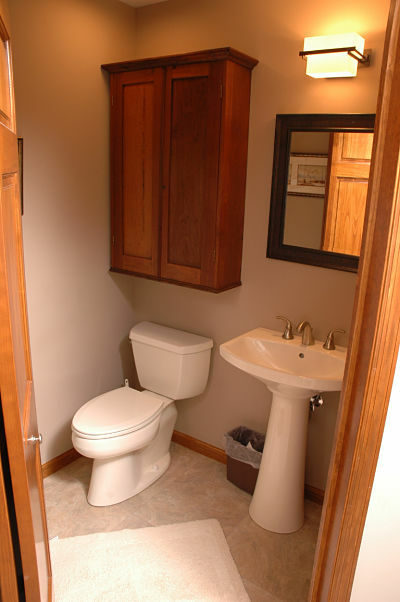 There are several options for adding storage to a commode area but the most popular include adding a cabinet above a toilet or a medicine cabinet over a sink. Depending on what you need to store, floating shelves may also provide a solution. Commode areas are tight spaces. 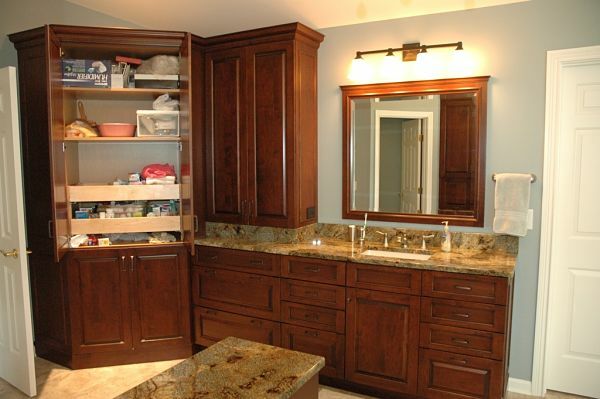 A wall cabinet and medicine cabinet over the sink provide needed storage. Deep cabinet drawers are a tried and true storage solution for both kitchens and baths. Since many small items are used in bathrooms, apothecary drawers are now trending in bath design. 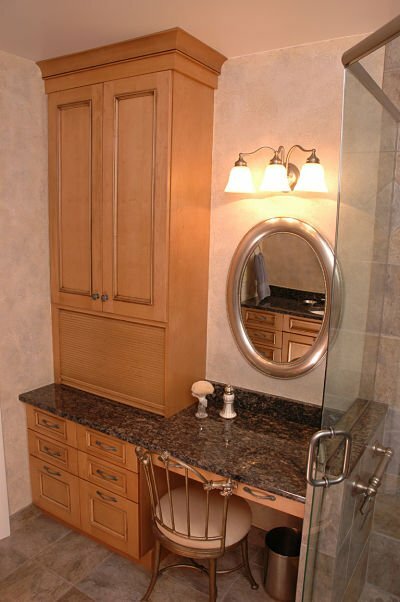 Drawers in varying sizes were used for the vanity sinks of this master bath. Apothecary drawers are used for the dressing table to store cosmetics and other small items. The wall space below a window can have storage potential. Often there is enough room for storage drawers that can be used to create a bench for seating or display. A bench with drawers was placed on a wall under a window to optimize storage space.